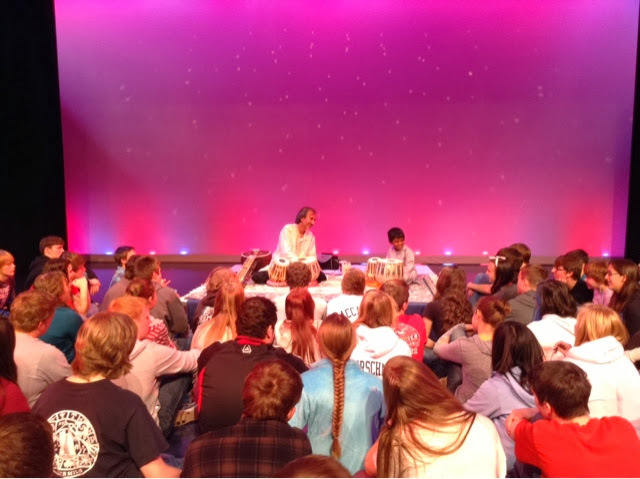 On November 22, lake zurich high school students were visited by master of the sitar and the tabla, Sandip Burman. Mr. Burman and one of his current students spent over an hour entertaining and teaching students about the intricacies of Indian classical music. The music is so complex that it was hard to know where to start when listening, so this gave students an introduction so that they would know what to listen for. It's a good combination of composed music and improvisation. It has it's similarities to jazz but also much stricter rules like western classical music. On the tabla, students were introduced to rhythmic solfege, a concept that is completely foreign in western music systems. Senior Jacqueline Brown commented that the rhythmic complexities and solfege have much more in common with African and middle eastern systems. Mr. Burman's rapport with the students was light-hearted and understanding of their interested but uneducated ears asking them from time to time if they were bored. The students made it clear that they were not, continually asking questions that made it clear that they wanted to understand what was going on. They were amazed at how he was able to pull emotion out of the sitar and the significant tension and release of the music. Mr. Burman compared the sitar composition with a four movement symphony. The first movement was a slow introduction of the melody, the second ads rhythm to the melody and some variation, the third much more activity and increased improvisation and the fourth slowing back down and reminding the listener of the themes. It will be interesting to see what comes out of this. Hopefully a few students will want to pursue further understanding of the music. Regardless, the experience will forever help lake zurich students into a world of music that was largely misunderstood and foreign to them.